This cake makes everyone happy wherever it goes! A super-simple yet very elegant dark chocolate cake is filled with caramel and topped with marshmallow frosting. A hint of orange blossom in the caramel is special. Torch the beautiful white peaks and valleys on your cake for a toasty, s’mores-like effect, one I just can’t get enough of. It’s no secret around here that I have a thing for the showstopper cake. I love to see them, eat them, and of course, bake them. I’m certain that my adoration (giving way to heart palpitations; i.e., passion) is rooted in nostalgia, and family cake DNA. Grandma Abowd, Mom’s mother, could do anything at all that she tried her hand at. That she put her hand to cake baking and decorating, among many many many other things, has always excited and inspired me. Her daughter, my Mama, also got into it, baking the Betty Crocker house cake for Peggy’s birthday one year, the Betty cat cake for my brothers, and the annual pink meringue-covered chocolate cakes for mine. 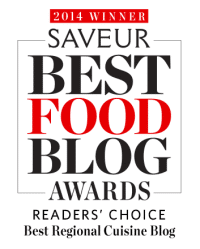 I thought I had nailed the chocolate cake with pink fluff when I first started blogging here. It was from Miette, my San Francisco dream bakery, with a basic White Mountain marshmallow-style meringue frosting. But in the last two years, I’ve had a couple of epic fails with that cake, and with the frosting. My niece Maria and I made no fewer than 5 attempts in one day at the frosting for her birthday cupcakes. The results: Fail, fail, fail, fail, fail. We were in Florida, so I chalked it up to humidity. I also chalked it up to the low-grade thermometer we were using (which we replaced mid-baking by running to the grocery store for a new one, along with more eggs of course). Maria would not give up. Aunt Maureen would not give up. Ultimately we frosted the chocolate cupcakes with the last batch of fail and talked about how that round wasn’t nearly as bad as the others. She’s also an optimist, which I try to emulate. Then I heard from my friend Jodi up in Michigan around that same time that she tried to make the cake. Guess what? Fail. She had no stand mixer, so I decided that had to the be the problem. Another of my own #fails with the double chocolate cake itself (the center was sinking in hopelessly) lead me to try lots of other dark chocolate cake recipes. I wanted one that could be baked in a standard pan (the other was baked in a smaller, 6-inch pan with 3-inch sides). And I wanted deep, dark chocolate flavor. And moistness. Here and there I found a few I liked very much, but then the recent chocolate cake offering from Cook’s Illustrated knocked my socks off. They call it a “dump and stir” cake, which just means you don’t use a mixer to make the batter. I went all the way with their caramel filling and scented mine ever so lightly with orange blossom water (oh Lord yes). Oh, and this is not scary-caramel; it’s easy-caramel. You can do the caramel filling, but it’s absolutely no step-down to skip the caramel and fill with more of the meringue (marshmallowy) frosting. 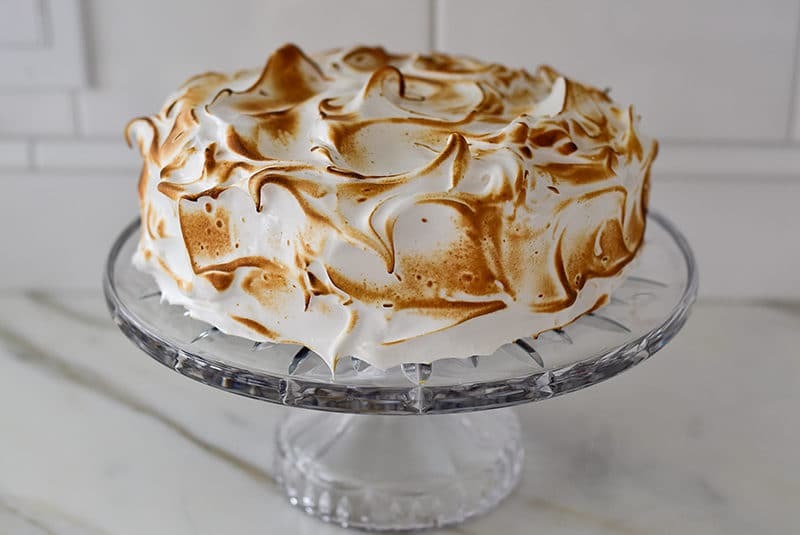 Last summer, I read about a truly stunning, game-changing (you know how I feel about those) way to make the meringue that is along the lines of a Swiss buttercream method, where the eggs and sugar are warmed up in a bain marie (double boiler, in a bowl over simmering water) and then whipped. What’s great about this is that there is no hot simple syrup to deal with, which is traditionally made and very slowly beat into the egg whites. 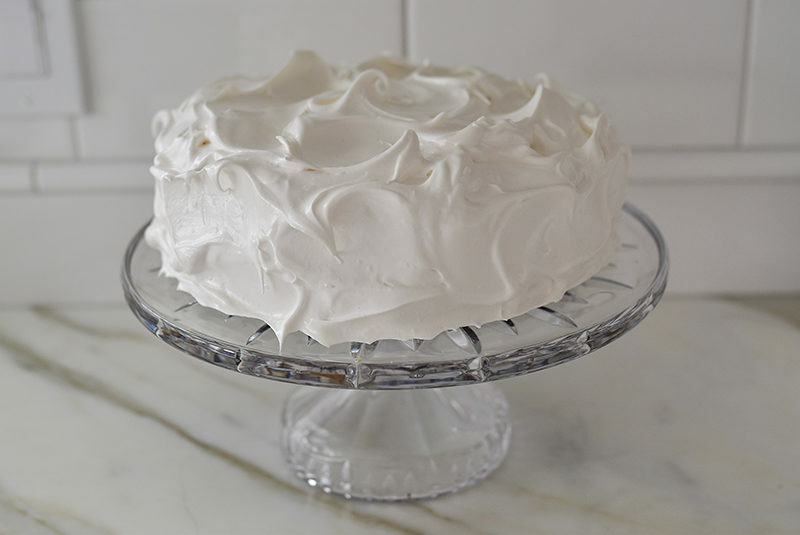 The resulting marshmallow cloud of an icing is fun to make, and even more fun to dollop and swirl all over the cake. The icing on the cake (!) is to torch your meringue to toast the swirls with a little culinary blow torch (you can get them at kitchen shops or online). Now we’re up there in the category of showstopper! I just know Grandma Abowd would approve with that big smile of hers. My mom and everyone else who has tasted this cake sure does. Gorgeous + delicious dessert to rock any holiday, birthday, or fun-day table. Go for it, and I promise: no fails! This cake is based on one from Cook's Illustrated. 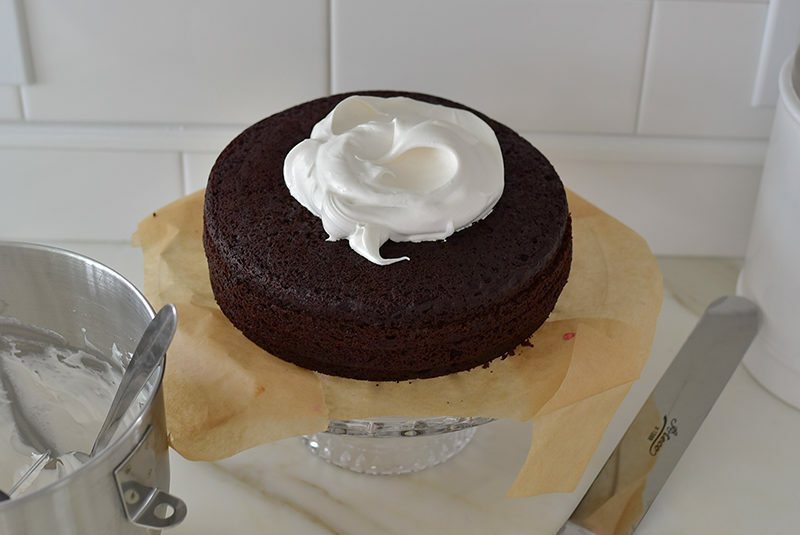 There are some options here if you want to simplify: while the recipe calls for slicing each 9-inch cake into two rounds for four total layers, the cake is equally wonderful as two layers, without slicing it (use just 1/3 of the caramel to fill between the two layers). The caramel filling is special, yet that can be replaced with more of the meringue frosting instead. The cake can be made a day in advance; if you’re making the caramel filling, fill the cake layers, then build and refrigerate the cake, covered with plastic wrap. If you’re not using the caramel filling, just wrap the layers uncut in plastic wrap and refrigerate them for up to one day. Make the frosting and frost the cake the same day it is going to be served. Frosting a cold cake straight from the refrigerator is much easier than frosting a room temperature cake (fewer crumbs). Adjust an oven rack to the middle position and heat the oven to 325 degrees. Grease two 9-inch round cake pans, line with parchment paper, grease parchment, and flour pans. Sift flour and cocoa into a large bowl. Whisk in sugar, baking soda, baking powder, and salt. Whisk buttermilk, water, oil, eggs, vanilla and espresso powder together in a second bowl or large measuring cup. Whisk buttermilk mixture into flour mixture until a smooth batter forms. Divide batter evenly between prepared pans and smooth tops with rubber spatula. Bake the cake until a toothpick inserted in center comes out clean, 22 to 28 minutes, switching and rotating pans halfway through baking. Let the cakes cool in pans on wire rack for 15 minutes. Remove cakes from pans, discarding parchment, and let cool completely on rack, at least 2 hours. Off heat, carefully stir in cream, butter, vanilla, orange blossom water, and salt (mixture will bubble and steam). Return saucepan to medium heat and cook, stirring frequently, until smooth and caramel reaches 240 to 245 degrees, 3 to 5 minutes. 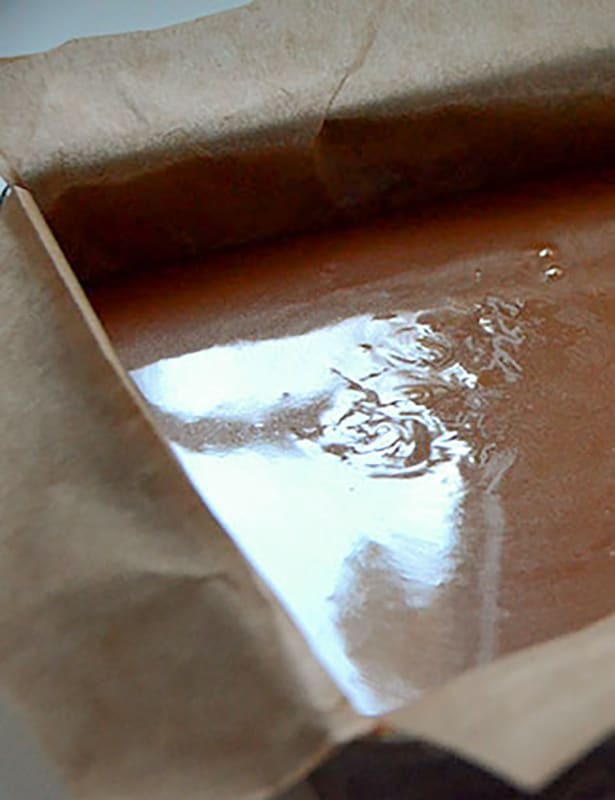 Carefully transfer caramel to prepared pan and let cool until just warm to touch (100 to 105 degrees), 20 to 30 minutes. 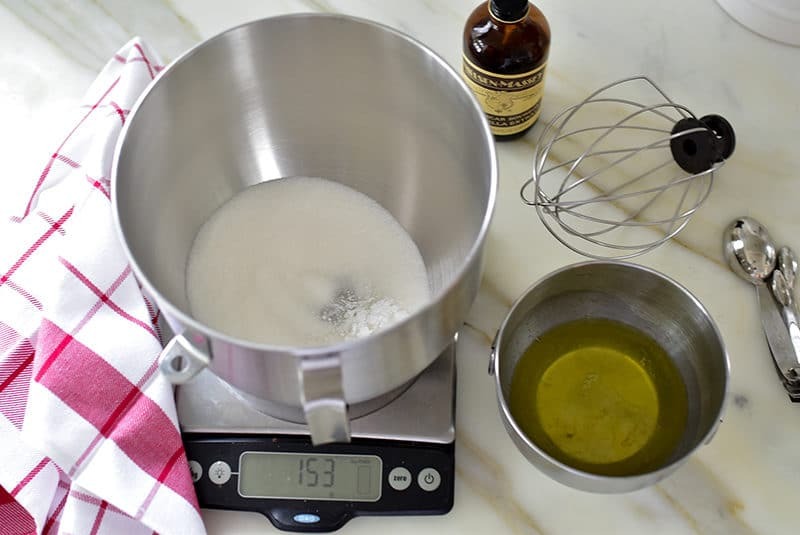 In the bowl of a stand mixer, stir together the egg whites, sugar, cream of tartar, and salt. I use the whisk attachment to stir. Set the bowl over a saucepan of simmering water, making sure that the bowl has some clearance above the water (we're cooking very gently with the residual or steam heat here). 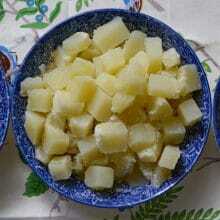 Heat, stirring frequently, until the mixture reaches 175 degrees, about 8 minutes. Transfer the whites to the stand mixer with the wire whisk attached. Beat, starting slow and increasing the speed steadily, until the mixer is on full. 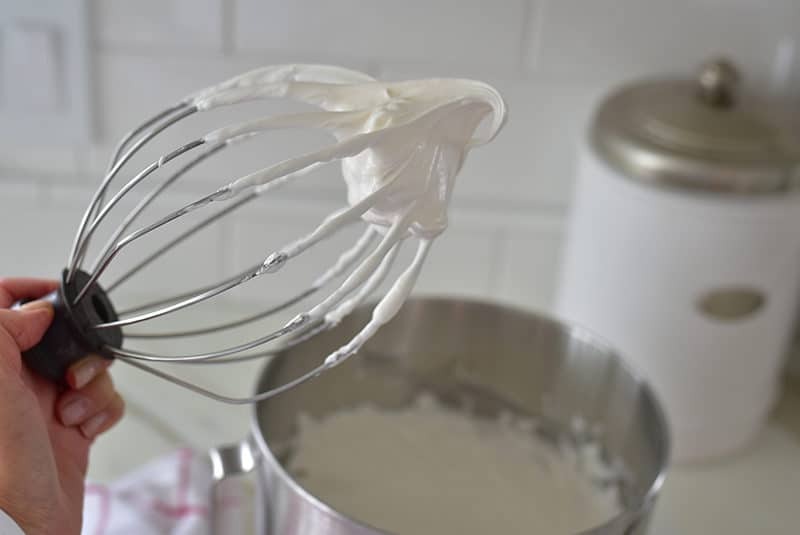 Whip until the stiff, glossy peaks form, 5 to 7 minutes. Stir in the vanilla and beat briefly. Using long serrated knife, score 1 horizontal line around sides of each cake layer; then, following scored lines, cut each layer into 2 even layers. Line edges of a cake stand or platter with 4 strips of parchment to keep the cake platter clean. Place 1 caramel-covered cake layer on platter. Top with second caramel-covered layer. Repeat with third caramel-covered layer and top with final layer. Now you can cover and refrigerate the cake for up to one day. Spread the marshmallow frosting thickly and evenly over sides and top of cake, making peaks and valleys with an offset spatula or the back of a spoon. Take care not to get chocolate crumbs in the beautiful white meringue. Toast the marshmallow by lightly skimming the surface with a culinary torch. 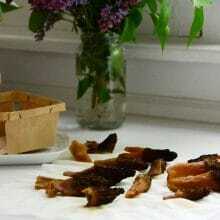 Carefully remove parchment strips. Leave the cake out at room temperature until serving, same (special) day. 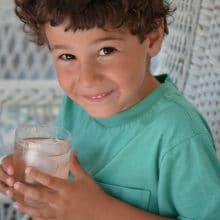 11 Responses to "Showstopper Chocolate Cake with Caramel and Marshmallow"
Could you use rose water instead of orange blossm water? Absolutely Carol–just use the rose water very sparingly, a few drops. Delicious with the caramel. Do you need testimonials about how amazing this cake is because I am happy to scream it from the rooftops! Hi Maureen! Happy New Year! I made this cake for my NYE party and it really was a show stopper! Delicious! I did struggle with the caramel, though. I made it twice, and both times it came out very thick, more along the lines of a candy than a cake filling. Both times I used a candy thermometer and it came out the same way. I couldn’t even spread it- instead, I cooled it in a 9in square pan, turned it out, cut out a circle, and laid it on the cake all in one piece. This made slicing really tough. 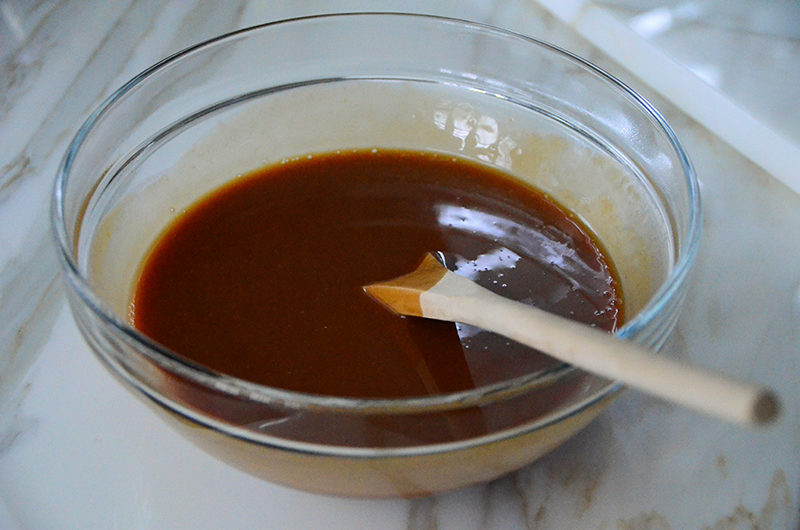 Any tips on making a lighter caramel, perhaps more like dulce de leche? I’m so happy to hear you baked the showstopper cake! But strange about the caramel. I wonder about the thermometer calibration, and otherwise you could try heating it below temp by at least 5 degrees so it’s not so thick. Take a look at the Cook’s Illustrated video of the caramel; it’s quite thick but I agree it shouldn’t be as thick as you’re experiencing. YES!!! Let me know how it comes out! 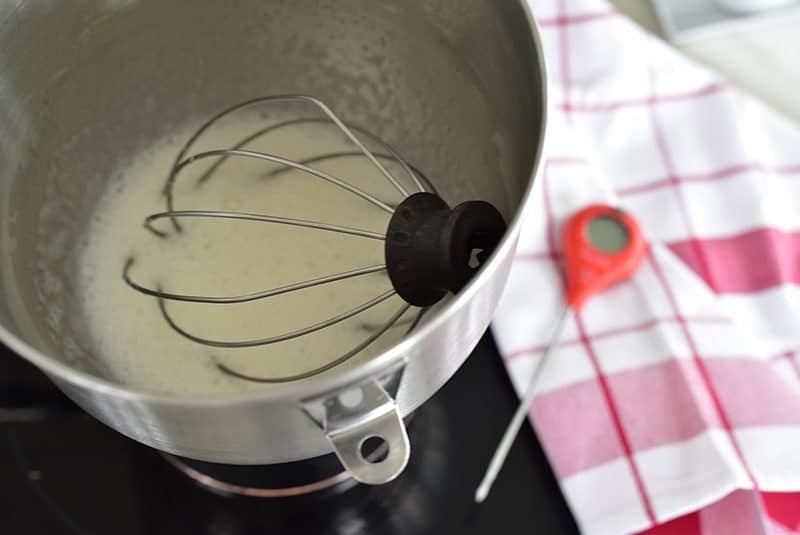 Hi there–when using the double boiler to melt the sugar and gently heat the egg whites, use a spoon or a whisk there. Then move to the stand or electric mixer with whisk attachment. Sorry for the confusion!